A chemical defleecing program was undertaken at the Clunies Ross Animal Research Laboratory in Sydney. 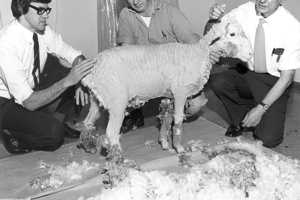 Tony Holmes (centre), an accomplished shearer by conventional methods, demonstrated how easy the job could be if chemical defleecing became a commercial proposition. He is watched by Peter Booth (left) and Alan Richardson.